Louis Van Gaal said he was proud of his players’ effort despite seeing his side getting knocked out by Liverpool in the Europa League on Thursday night. Trailing 2-0 going into the tie, United went in front through an Anthony Martial’s penalty and, for a brief moment, looked like they could turn the tie around. Those hopes, however, vanished when Philippe Coutinho equalised just before half-time, leaving United in need to score three goals int he second half. 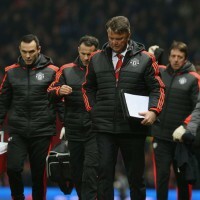 “I am not angry and I am not frustrated,” Van Gaal said. “I was very proud of my players. I was very pleased that the fans also recognised that. The United manager added United had thrown everything at Liverpool and will live to regret some of the chances they missed. Admittedly we were better than the first leg especially in the first half before Liverpool equalized. But as we are not used to playing at a high tempo and pressing we were always going to run out of steam. We needed to get the two goals in the first half. Sure if Rojo had scored his sitter it could have changed the game but we should have created a lot more chances. I was also disappointed with the team selection. Mata was awful in the first leg and was completely unsuited to the higher tempo we were trying to play with. It would have made more sense to play a 4-4-2 and had Depay on the left wing. While Depay has consistently sucked on his day he is unplayable and it is ludicrous even when we needed to score 3 goals he was not even brought on as a sub. Fellaini was disappointing and I really do not understand why Van Gaal keeps playing him. Herrera would have been a much better choice.